A racehorse spends about a tenth of its working life resting or convalescing: 65% of these temporary interruptions to its working life are due to locomotor problems. More than half of all sporting horses and racehorses will see their working life come to an end because of a locomotor problem or chronic lameness. Furthermore, locomotor disorders are the second main cause of mortality in the horse in Europe, the first being digestive problems (represented mainly by colic). 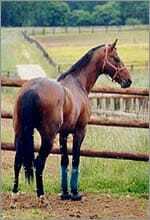 Thus not only fractures, but also joint problems, laminitis (etc.) are responsible for 10% of deaths every year. Pain and discomfort, which are manifested by an irregular or asymmetric gait, may be disabling for racehorses or competition horses: lameness of this type can in fact impair performance in competition horses. Impaired performance, indicative of a reduction in the physical abilities of the competition horse, is a source of much frustration for the rider or trainer. Furthermore, understanding why a horse starts to under-perform is a real diagnostic challenge: although locomotor problems represent the main cause of loss of performance, many other conditions, affecting the respiratory, cardio-vascular and other systems may also be involved. Clinical lameness, which is obvious and clearly visible, which stops a horse from competing or even training, is the most obvious manifestation of a locomotor disorder, and is disabling even for a horse used only for hacking. Lameness is the pet hate of the horse rider or trainer, it is always difficult to diagnose, and treatment is often long-term. All too often, lameness in a competition horse is synonymous with stopping work, preventing the horse from racing or competing for a period of time. Losses on a sporting and financial level are all the greater as even training is generally prohibited: the horse then loses physical condition and regresses in its work.